Heavyarms has now officially been added to the NHD team! Special thanks to David Mullis Photography and It’s Your Promotions for helping us out with all aspects of dealing with Heavyarms and their amazing music. As you can see in the above promotional shot, Heavyarms will be rockin NHD Clothing at their shows and possibly even throughout an upcoming tour. Formed in mid-2009 HeavyArms set out to produce fast, heavy, raw music full of emotion, dynamics, and off-time signatures. After going through a brief myriad of member changes and a name change, HeavyArms solidified their lineup with founding members Patrick Hale and Will Wheeler recruiting Ethan Thompson, Eric Pochek, and Cameron Schnur. 2010 saw the debut of HeavyArms’ first EP entitled “Colonies”: a 5-track barrage of raw angst, frustration, loss, and realization. 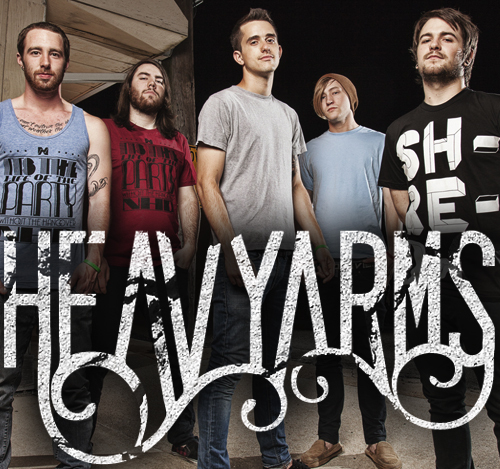 With the release of 2 new songs in the beginning of 2011, HeavyArms have found their sound and plans of a winter release for their first full-length have been put into motion along with a spring tour and a month and a half long summer tour. Heavyarms is coming in hot. We’ve reached our capacity with endorsement/sponsorship deals until the next couple line releases from NHD Clothing. That being said we are always looking for new bands and athletes to add to the NHD family. If you’d like more info about how you can become endorsed/sponsored by us send an email to Nick@NickHammondDesign.com and we’ll send you a short questionnaire. Not all entries will be accepted as we only deal with the best.